Often in this “wide world of web” there’s a lot of confusion with terms and their meanings. Two such terms, the differentiation between which is tricky, are “Web design” and “Web development”. Technically put, the usability and visual aesthetics of a website containing the information flow, layout, color scheme, and everything relating to the visual aspects of the UI/UX refers to a web design. But if you could understand that language then you would not be reading this blog, looking for all your answers. Put in a language you will understand; as a user, whatever you see flashing on your screens, being unaware of the mechanisms beneath it, that are actually making it all appear this way, is indeed a web design. When you get all impressed with a web design, web development is the one who should take all the credit. So basically, web development is the lady behind the success of the man called web design. It is what makes the whole website tick. It splits into 2 categories called front-end (client-side) and back-end (server-side). Front-end is that code which decides how the website would be displayed using the designs of a web designer. The back-end of an application is the code deciding the management of data within the database and how that data will be served to the front-end in order to be displayed in a particular pre-determined manner. 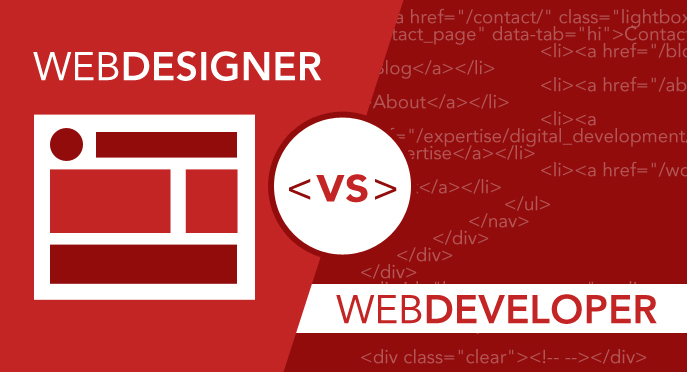 As you may have guessed, the front-end developer is the one who shares the most overlap with the web designer of the company. As the whole visual appeal of a website depends on these mechanisms, the team of professionals dealing with this need to be experts in their field. This blog has now cleared your doubts as to how to differentiate between a web design and web development. However, you should also know that though there are web designers and developers for the respective fields, recent times have also seen the entry of people who have the skills for both, a web designer as well as a web developer. Want to hire the best web design and development company Indore has? Call us on 0731 254 1056.